Summer Semester (online courses) start June 3rd, 2019. The courses required for the Master of Biblical Studies are required for the basis for the M.Div. Biblical languages requirement: one year of Biblical Hebrew, two years of Biblical Greek or New Testament Aramaic. ​ The core of this program is the M.A. in Biblical Studies at ATS. Those courses are required. Seminary English is possibly fulfilled. All Biblical language courses are $300. each, 4 credits. Published books, life experiences, etc. could possibly be given seminary credits. Ones academic adviser will help the seminarian choose core courses and electives based on ministry goals. Core Courses and electives for the M.Div. degree. Core courses and electives are determined by your goals. Using Biblical O.T. and N.T. Aramaic, Hebrew and Greek to determine the timeline for the Endtimes. 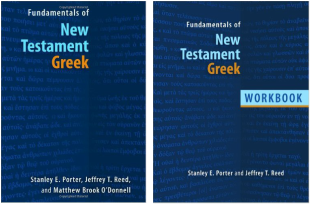 Biblical Languages - Hebrew, Greek, N.T. Aramaic $300. per semester for language courses. Biblical Greek - Dr. Bruce Klein, Th.D. ​ Dr. Klein's Greek grammar is also a required textbook. 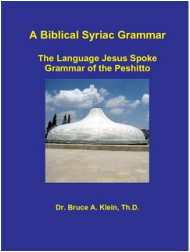 Dr. Klein's Syriac (Aramaic) grammar is the required textbook, 278 pages, 8.5x11. The M.Div. degree program requires two years of Greek or Aramaic, plus one year of Hebrew.